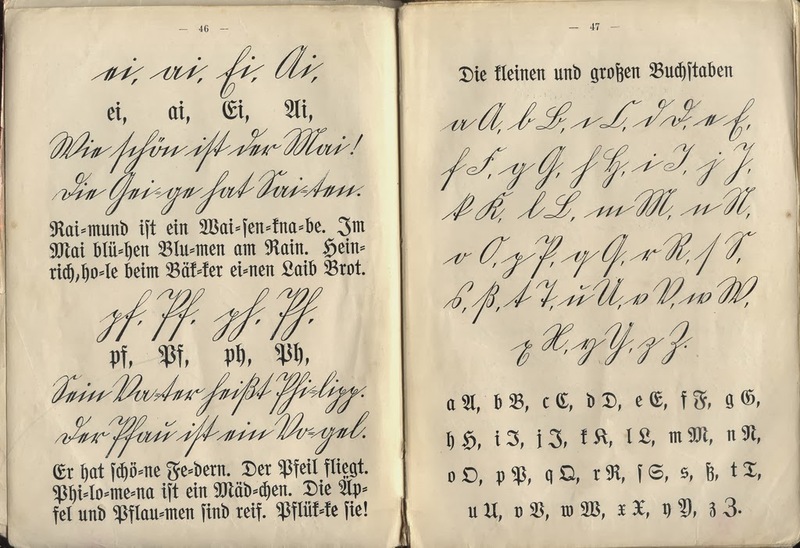 Mennopolitan: Why are most Low German people illiterate? Why are most Low German people illiterate? The Old Colony believe “ji meha jiliehet, ji meha fitchiehet” (the more learned the more misguided). “Why waste all that time going to school?” “You don’t need to go to school to learn how to be a good hard worker, a house wife or a mother.” I went to an Old Colony Mennonite school in Mexico. At this school we learned how to do basic math and how to copy verses from the Bible. We learned only from the Bible. We did not need to learn how to write our name, or read anything else. We were even told not to read the Bible too much because we were not supposed to know too much about the Bible either. There are four levels we learned. The High German Bible, the Old and New Testament, the Catechism and the Fible. 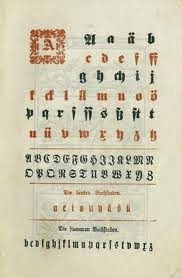 We would sing from the hymnbook in High German as well. The photo to your right is from the Fible that is the first book we learned from when we stared school. we would learn how to copy the ABC'S you see in the photo. When I read the Bible I only understood a few words I was reading because at home we spoke Low German and at school we read and spoke High German. We were never introduced to High German before we started school. I didn't like school at all. It was not a fun environment. There would be one teacher per school for all the kids in the village ages 6 to 13, about 75 to 85 kids in total. The boys sat on the right side of the school and the girls sat on the left side. If you were caught looking out the window you had to sit in the window if you were late, you had to stand in the door for 10 minutes. I often sat there and pretended to read, but I would fantasize about being a Mexican school girl. Whenever we drove past a Mexican school, those kids looked so happy. They would play basketball and skip and laugh. I would be having pleasant time thinking about this and then the teacher would throw the belt at me. Whenever this happened you had to bring the belt up to the front, so everyone could see who was slacking. I barely got to the third level by the end of my last school year. “Anna is a hard learner.” “That was a never ending story,” That is why she is not at school,” my mom would explain to everyone she met. It was embarrassing and I felt like a failure. Being a “HARD LEARNER” I spent a lot of time alone, in hiding reading Spanish books that Mexicans would sometimes drop off while driving through our village, old books their kids would no longer need. I heard some kids singing the alphabet in Spanish. It was so interesting to me that I memorized it not even knowing that it would help me to read Spanish. My mom didn't care as long as I was done doing my chores. I could read all I wanted i even understood some words I was reading. That was foreign to me. I remember the feeling of being lit up from the inside out, which was the first time I felt a tingling sensation in my stomach that was not from being scared. "The more learned, the more misguided"